Welcome to Di Moda Salon, where meeting the needs of our valued clients is our central focus. We are a full service hair and nail salon and provide the highest quality salon services. Di Moda features a highly experienced professional staff of hair designers, colorists, and nail technicians. 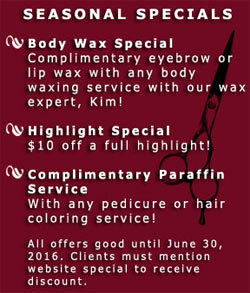 We offer a full line of hair services, manicures, pedicures, and waxing services. We specialize in hair color. Di Moda's management has been in the salon business for more than 34 years. Our staff are dedicated professionals who truly make our guests feel at ease and comfortable with each and every visit. Since no two clients are the same, we listen carefully to our customers to ensure they receive a service tailored to meet their individual needs. Di Moda recognizes that keeping up with the latest trends and innovations is essential to increase knowledge and boost creativity. Our associates are comprehensively trained in our retail products to ensure each client uses the products that are right for them. Di Moda Salon is conveniently located on Route 33 in Mercerville, New Jersey. Click here for directions to our facility. And remember, at Di Moda, your satisfaction is guaranteed!